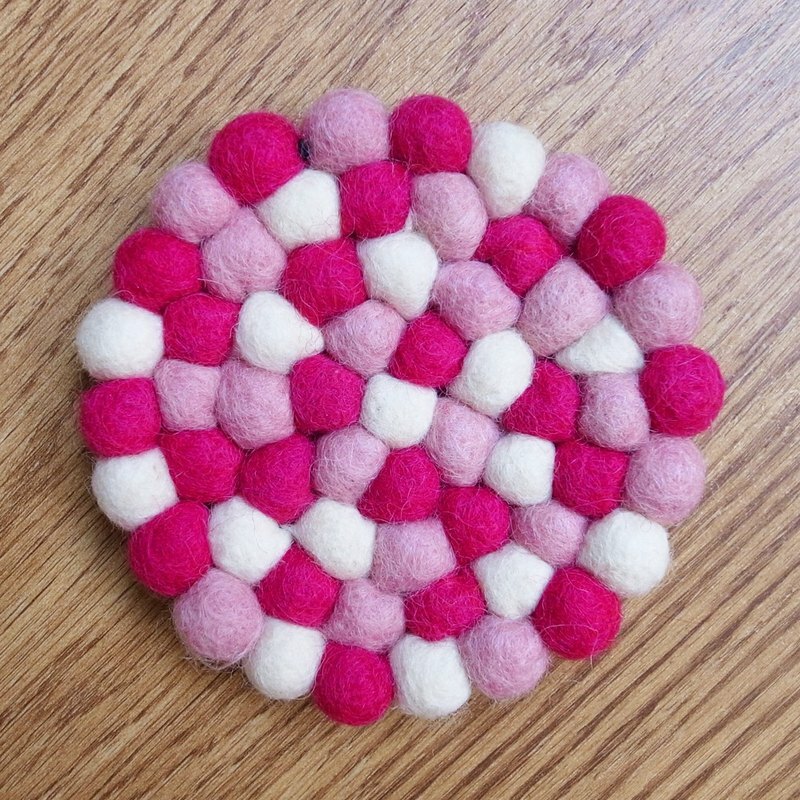 【Set of 4---12%Discount】 Please choice any 4 "Felt Coasters" （Dot / Ball (Round / Square), Any Color） Buy it here：https://www.pinkoi.com/product/KKNC3hUT?category=5 This coaster is hand felted and held together using high quality embroidery thread by the local Nepalese women in Kathmandu valley. It will provide protection and add style to your table. They also make wonderful gifts. / Size / Diameter：10±1cm (This product is handmade, and so slight variations in size are to be expected.) Notes： Slight variation in color, size, and shape on it enhances the individuality, making each piece unique and special. / Materials / 100% Wool Felt Details: Felt is a fabric which is unwoven. Felt gets its property due to entanglement of fibers with each other. Felt is formed by applying heat, moisture, and pressure on wool or fur. First, heat and moisture is applied on the fibers. Then outer scales come out. In the soap or an alkaline environment, these fibers slide freely with each other resulting in a fine entanglement of these fibers. Also, there is bonding among these fibers due to the protein content in them. This results in a stronger entanglement. Lastly, pressure is applied so that it transforms into a fine fabric in the form of felt. / Care / 1. Wash this product in cold water only, and do not bleach. 2. To reduce lint, hand wash this product with a little neutral detergent or shampoo with conditioner. 3. Hand wash by gently pressing the material, and do not rub with force. 4. Hang dry and avoid direct sunlight. 5. To maintain the shine and color of this product, regularly use a good quality brush to remove dust from its surface. 6. Use a pair of fine scissors to remove any lint found on the wool felt. 7. When not using the product, please wash it and let it dry completely before storing it in a sealed bag. / Package / 1. Basic Package：Pack with the zipper bag or the OPP bag, or the clean big bag if the product has the big size or you buy many items together. 2. Basic Package for the gift：If you want us to package the product to be a gift, please tell us when you buy it, we would put our brand sticker on the zipper bag. / Shipping / Ready to ship in 3 business days.